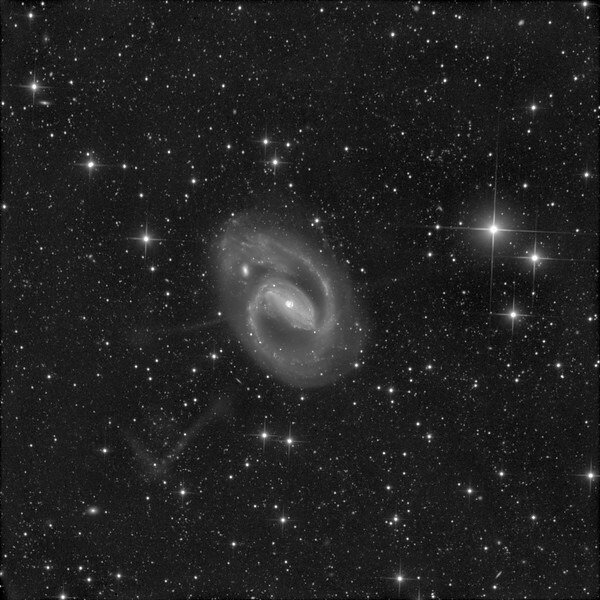 NGC 1097 in Fornax processed to show 3 of the 4 "rays" or "beams". The rays have the spectra of stars, not gas, and are thought to be due to cannibalized satellite galaxies. The brightest ray is toward 8 o'clock and is L-shaped. Te second-brightest is toward about 8:45 and is straight, with a faint lollipop end. The faintest is an extension of the second, heading off toward 3:45 and is only just discernible in this image. The fourth (not visualized here) is an extension of the first, and heads off toward two o'clock. 6 off 1-hr 2x2 binned plus 3 off 1-hr unbinned subs. The rays can only be captured on the blackest, most moonless, cloudless, crispest of nights.